Politically charged with moral messages about consumer responsibility, Edward Zwick’s latest film Blood Diamond has more than a few problems. I teeter-tottered over it for a while, not sure if the pros outweighed the cons. The scale, for me at least, has tipped to the cons, but that doesn’t mean you won’t like it. I wouldn’t blame you if you did. Blood Diamond has a lot of potential, mainly as a result of its star, Leonardo DiCaprio. If you can sift through numerous clichés, you might find a reasonably enjoyable political adventure film. 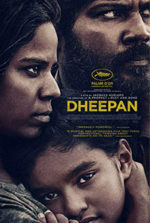 Leonardo DiCaprio plays the diamond smuggler Danny Archer; Djimon Hounsou is an African family man named Solomon Vandy, separated from his wife and three children during a diamond-funded civil war in Sierra Leone; and Jennifer Connelly is Maddy Bowen, a journalist trying to expose the U.S. to the horrors funded by blood diamonds. Vandy, while working as a rebel slave in a diamond mine, finds a pink diamond the size of a large bird’s egg and hides it. Archer needs the priceless diamond to escape Africa, where he’s lived his entire life. And Maddy needs Archer to supply her with names to complete her ‘story of the century’. I found myself distracted by blatant political discussion throughout the movie. For example, there’s scene where one African refugee says something like, “Pray they never find oil here.” There’s nothing wrong with labeling America the oil whore of the world, because we are. It’s a horrible truth, but one that should be discussed in another film. This one’s about diamonds, not oil. And if the film meant to link the two somehow, it didn’t succeed. There’s also an off-putting scene when Archer and Vandyare climbing up a steep, rocky hill. Tensions between the two are high, as neither man trusts the other. Suddenly, Archer slips and can’t pull himself up. Vandy puts out his hand to assist. Archer thinks about it for a moment and then puts his hand in Vandy’s, signifying an “I trust you now” action. I was expecting an ’80’s rock ballad to take over the score. Every movie featuring a climbing scene includes a cheesy moment analogous to this. Because the film peters out in the end, I couldn’t help but feel betrayed, since it began so well. In the first hour, Blood Diamond deals with very disheartening, if not shocking imagery. A major plot point involves Djimon Hounsou’s character trying to get his son back. Vandy’s son was taken by a rebel group using children as soldiers. I doubt it’s a coincidence that Vandy’s son’s name is Dia, as in DIA-mond. Dia is as important to Vandy as the diamond is for Archer. (Thanks for beating that into our head. We would have figured that out without the clever name…). Dia is essentially brainwashed into a killer by the rebel leader. Much of the film’s most powerful imagery involves children being bred into killers; they blast away innocents, with machine guns bigger than they are. It’s scary, actually, because in the second half you begin to feel a real sense of danger whenever these children are present. They are not children; they’re soldiers capable of terrible violence. A Good Samaritan makes the mistake of treating these children like children, and he’s punished for it. Not since Schindler’s List have I seen so many families and children senselessly killed on film. Schindler’s List had a tempered, somber poignancy outlining the tragedy of death when involving women and children. 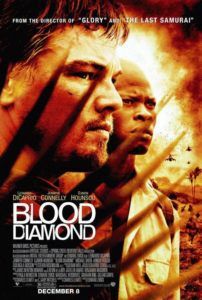 Blood Diamond mows down families in a split second, never giving them a second thought. The speed at which it passes over the dead is appropriate, as so many victims are forgotten in the chaos of this type of war. If for nothing else, the principal reason I enjoyed what I did was Leonardo DiCaprio. The actor is capable of so much, particularly in the last few years. His last three movies, Catch Me If You Can, The Aviator, and The Departed have all marked his incredible range. DiCaprio’s South African accent is dead on; his intensity is authentic; his trademark of great acting us sustained in every scene. My major complaint is that the director, Edward Zwick, has made another white-centric film (which is pretty hard to do in a film about African diamond feuds). 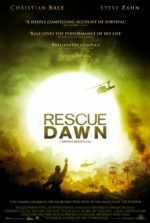 He turns it into a story about Archer, though the heart of the film dwells in Vandy’s desperation to get his son back. Zwick did the same thing with The Last Samurai, by making Tom Cruise the focus when that film’s spirit resided in the Japanese samurai leader played by Ken Wantanabe. And in Glory, Zwick told the story of the first black Civil War company with Matthew Broderick as the main character. Blood Diamond, while it says everything a political story should say, lacks the ability to deliver its message eloquently or without blatant underlining. The aforementioned clichés are distracting, but the action and adventure themes throughout the film, not to mention DiCaprio’s fine performance, are so entertaining that the two balance out into a moderate pleasure.